What do you give the man who has given YOU everything for HIS birthday? For those of you who know my husband, Ben, please indulge me as I introduce the rest of you to the man who completes me and is the incredible father to our four beautiful children. Almost exactly 20 years ago, I was introduced to Ben on the backstage stairwell at the Cincinnati College Conservatory of Music. If you’ve been following this blog, you already know that we have been married for nearly 20 years. That being said, it’s safe to say that our courtship was a whirlwind. I knew from the moment we met, I would spend the rest of my life with him. Nine months later we were married. Today, we are beyond blessed. The road has not always been easy, but we have faced each obstacle head on – together. I’ve always told Ben that he is my “rock.” He’s a man of solid character with great devotion to his family, faith and friends. He makes me laugh. He reminds me that life is in the “little moments.” He’s a provider, protector and peace-maker all rolled into one. He’s my best friend and my true love. Ben has shown me a life that every little girl dreams of. He has given me so much…friendship, encouragement, compassion, support and boundless love. So what do I give this man who has given me everything? Truth be told, all he really wants are more “little moments”… hugs from the kids when he comes home from work, riding the lawn mover with Beau on his lap, cooking with his girls in the kitchen, sitting around the camp fire with wonderful friends, dancing with Bitty in his arms, sharing a meal with his family gathered around the dinner table and counting our blessings as we fall asleep each night, grateful for another day. Here’s wishing my “rock” a very happy birthday. Between our four children, we have had over 30 first days of school. Lots of excitement, tears, worry, joy and anticipation… for me, of course. And with the exception of once or twice, I would say that the kids have always been happy to start school. Today was no exception for Bitty. Afterall, we’ve been pumping her up all weekend with the excitement of starting school and having a teacher. “Teacher” is a new word for her, largely in thanks to Beau’s efforts repeatedly drilling her on it. 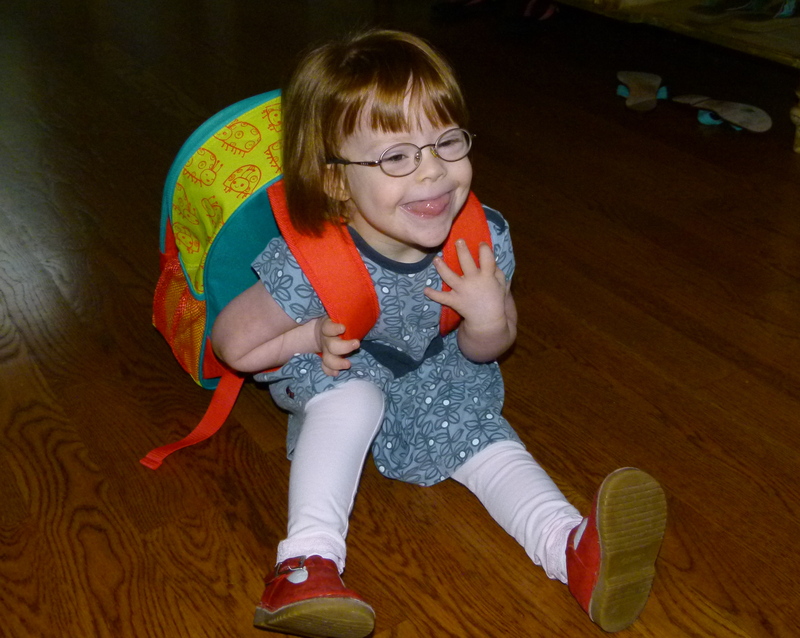 So off she went this morning…with a backpack half her size and a smile that is sure to warm her teacher’s heart. First stop in the new classroom… washing hands…one of her favorite things to do. As I drove home, I couldn’t help but think about the children throughout our world living with intellectual disabilities that never have the opportunity to go to school. The ones that are marginalized or institutionalized. The ones who are discounted and sometimes forgotten. And while our nation still has a long way to go with providing equal opportunities and respect for all of our citizens, I am encouraged that we are leaders in the world for positive change. For believing that every child has potential and every child is worth the investment. Once again, I’m filled with excitement, tears, worry, joy and anticipation for this new beginning. So proud of our Bitty and so grateful we live in a nation where she has the opportunity to grow and learn and be all she can be. Three years ago today, our sweet Bitty was born into this world. And while we celebrate this day as her birth, Ben and I believe that her life began 9 months before that. It was a complicated pregnancy with the odds stacked against us. From early on, doctors gave her a 25% chance of surviving the pregnancy. Week after week, we monitored the growth of a cystic hygroma that was threatening her survival. We were overwhelmed with worry, but we never lost hope. We prayed. Our family and friends prayed. Our community prayed. Week after week we watched the cystic hygroma grow bigger and bigger…and then one day it began to shrink. I get goose bumps writing this, because, it truly was a miracle. I share this because I hope that it will inspire just one reader to never give up hope, especially on a child. I understand how scary a diagnosis can be and how the medical community is obligated to run worst case scenarios, but I’m here to tell you that in spite of those scenarios, every life is worth praying for. Today Bitty is a healthy and very happy little girl. She has brought so much joy into our lives and into this world. I can’t imagine our family without her. HAPPY BIRTHDAY, sweet Bitty! We thank God for trusting us with your precious life. Today marks the beginning of a new chapter in the lives of my two oldest daughters and me. It’s a chapter that is sure to be filled with many trials and challenges but more importantly a chapter that holds infinite possibilities. 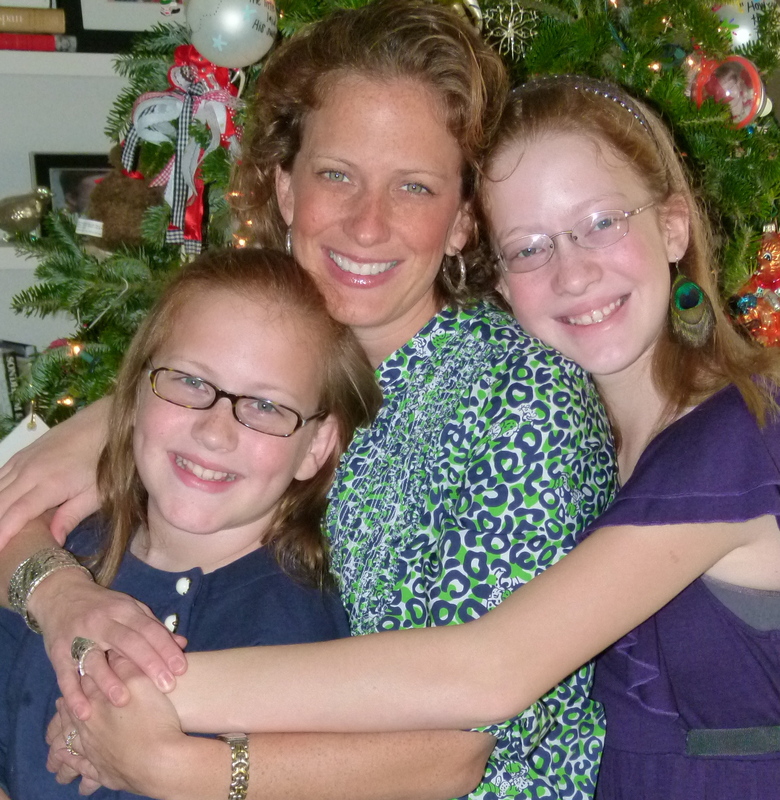 Today, my girls and I begin homeschooling. I’m sure many of you are wondering if I’ve lost my mind…having 2 children with special needs is challenging enough and now homeschooling. But quite honestly, having 2 children with special needs is probably the primary reason I have chosen this path. Lillie & Emma Grace are amazing young ladies. They understand that Beau & Bitty require constant attention which oftentimes means exercising patience, tolerance and understanding even in the most trying situations. They do this with grace. Homeschooling will be an opportunity to focus on them and to teach them things that go far beyond the text books. That’s not to say we won’t study algebra and science and literature…we will. But perhaps more importantly, I’m looking forward to teaching them things that you can’t find in text books. Things that require life experience…feeding the homeless, helping those in need, learning to advocate, becoming missionaries…I hope through this homeschooling experience, I will help build their self confidence and character and empower them to make a difference in the world. I was a few minutes late picking up Beau from school today. When I pulled up, I found him standing on the sidewalk with his teacher, Mrs. Long. The two have been friends for a long time. In fact, Mrs. Long (better known as Erin) was one of Beau’s first babysitters and Beau was the ring bearer in her wedding. It has been by the grace of God that Beau was placed in her class this year. And even with such a rich history between Erin and us, I still worry about him when he is at school. I worry that he’s happy. I worry that he’ll make new friends. I worry that he’ll do his work and be a good listener and wait his turn. So as I pulled up today and found the two of them hugging on the sidewalk, my heart sank for a moment because I was afraid it had been a bad day. I quickly parked and met them on the sidewalk. I can honestly say, I will never tire of hearing that phrase. I have such a deep appreciation for special education teachers and all that they do to enrich our children’s lives. For while we parents are charged with taking care of our children in good times and in bad, special education teachers have made THE CHOICE to do this. I have no doubt that it is one of the toughest jobs a person could love. Thank you Mrs. Long for the lessons and the hugs and especially the encouragement. It was the best day ever! As the parent of a special needs child, one of the requirements for accessing public education is developing an I.E.P. An I.E.P. is an individualized document that guides the delivery of special education supports and services for a student with a disability. For 8 years, I have been attending I.E.P. meetings. First for Beau and now for Bitty. These meetings, for the most part, are usually uncomfortable and unsettling experiences. Imagine a room full of specialists analyzing your child’s abilities, measuring their milestones and determining how much support they require in order to be successful in a school setting. It is supposed to be a collaborative effort between the parents and the school system’s team of specialists to devise the best plan for the child’s success. And while all that sounds good on paper, what happens in that room is something quite different. Needless to say, I became defensive. One question after another. One specialist after another. My child is the most miraculous, marvelous creature. She’s a loving, intelligent, funny, personable, imaginative, curious, caring and determined little girl that is constantly learning new things and making new friends. She is everything good in the world and every mother’s dream come true. She is the heart of our family and I believe she truly makes the world a better place. And so today, please forgive me for not appreciating the I.E.P. process. For each raised eyebrow, blank stare and line of questioning I endured – took a little bit away from everything that I celebrate about my little girl. At dinner tonight, the topic of conversation was–What do you want to be when you grow up? It didn’t take Beau long to answer “a doctor.” When I asked him why, he said “to take care of the children.” For a moment I felt sad because I wondered if someday he would feel disappointed in himself for not being able to attain this goal and then it hit me. Why not? I searched Webster’s dictionary interested in seeing the formal definition for “doctor” and there under definition #2 it said “a person skilled or specializing in healing arts. While Beau will probably (and I mean probably, because I believe where there’s a will there’s a way) never attend medical school and become licensed to practice medicine, I have already seen evidence of his skills in the healing arts. His compassion and concern for others, especially those that need it the most, is something we can all learn from. I believe my son will make a great doctor someday and when he does, I am sure he will take care of the children. I’M VERY GRATEFUL THAT MARIA SHRIVER SHARED OUR FAMILY’S STORY ON HER WEBSITE/BLOG. On July 14, 2004, our third child was born. A beautiful, bouncing baby boy! We were overjoyed. Three days later the phone rang and our world was turned upside down. Our son, Beau, had Down Syndrome. We held each other and cried, paralyzed with fear and overcome with sadness, afraid of the unknown. Five years later we welcomed our fourth child, Jane Adeline, “Bitty”, into the world after a complicated pregnancy, where doctors had given her a twenty-five percent chance of being born. Once again, the phone rang. Bitty had Down Syndrome, too. We wept. This time, however, they were not tears of sadness, but tears of joy. 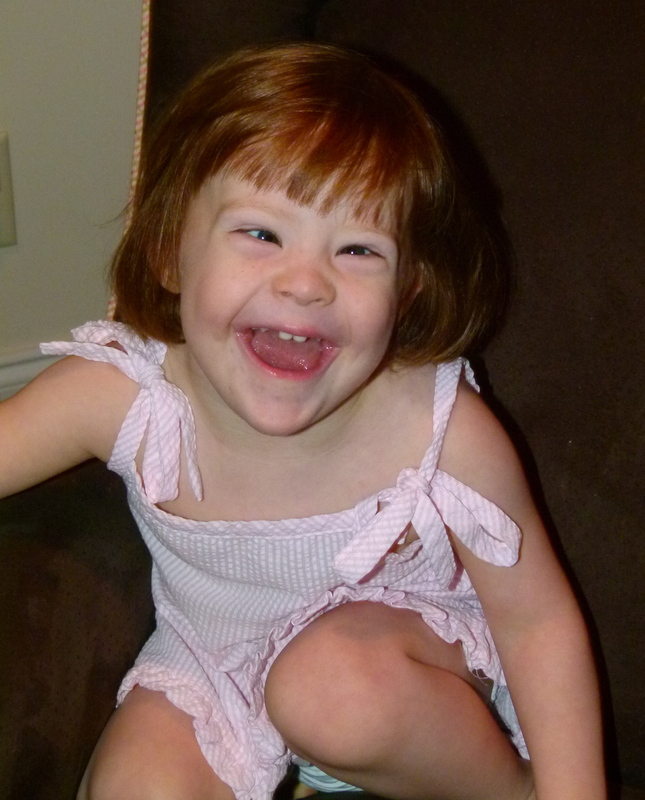 A second child with Down Syndrome. What a blessing! 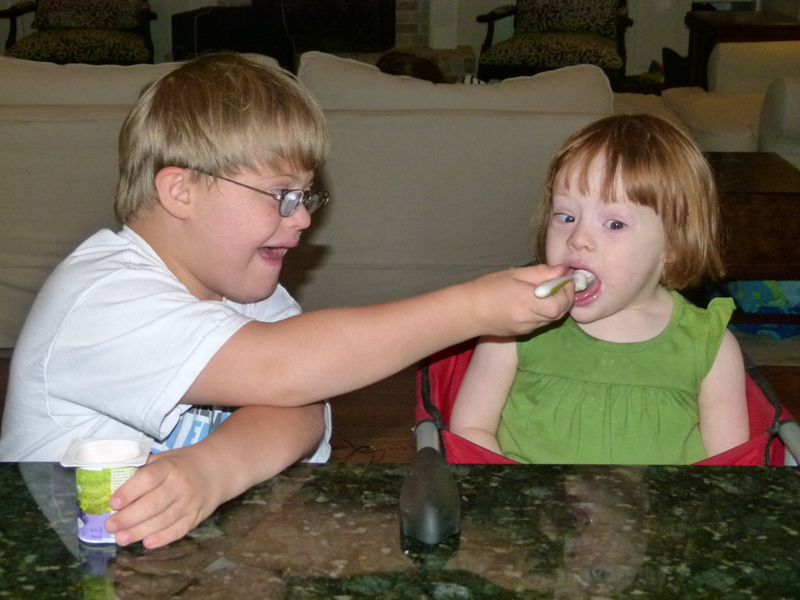 Growing up, I had very little exposure to people with intellectual disabilities. 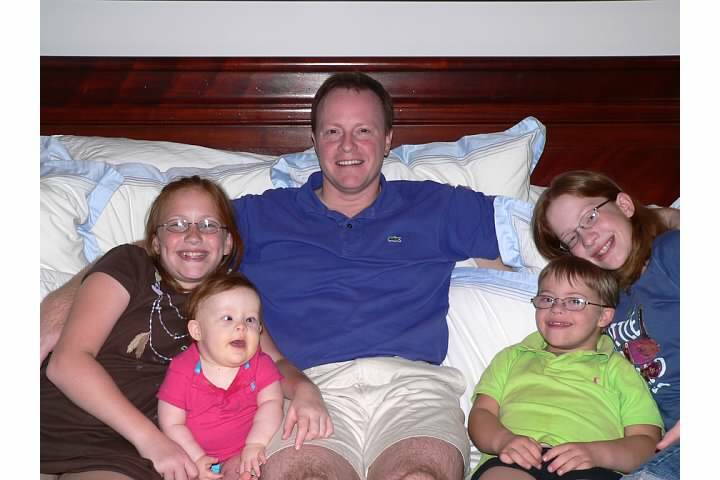 In fact, until Beau was born, neither my husband nor I knew much about Down Syndrome or any other type of intellectual disability. In the weeks that followed Beau’s birth, we were consumed with educating ourselves on every aspect of his diagnosis.What we quickly learned was that a diagnosis does not define a human being. From that day forward we have been on a mission to promote the acceptance and inclusion of all people, especially those living with an intellectual disability. Beau is now eight years old and Bitty is about to turn three. They are loving, intelligent, talented and funny. They are the youngest of our four children. Lillie (13) and Emma Grace (12) are their incredible big sisters who lead by example and inspire their peers to accept and include others, too. In March of 2012, I attended a support group meeting for parents of special needs children. The guest speaker was from the Special Olympics organization and the evening’s topic was the “Spread the Word to End the Word” campaign, which is a campaign to raise awareness of the hurtful effects of the word “retard(ed)” and encourage people to pledge to stop using it. As I sat there listening to the speaker talk about the campaign, my wheels began to turn. What could I do to help people understand the hurtful effects of this word? How could I help people understand that their use of the “r-word” affects not only those living with intellectual disabilities, but also the people that love them? How could I share our family’s story so that our personal experiences could make a difference in the world? The answer hit me like a freight train…through music. Both Ben and I grew up performing on stage and were fortunate enough to enjoy careers on Broadway. While that chapter in our lives was exciting, it never felt fulfilling. Here was an opportunity to use our voices to inspire change. I left the meeting that night feeling as if my life had come into focus. I felt as if my life’s purpose had been revealed to me. While I had been advocating for years, it was in this moment that I had finally found a platform on which to stand. This campaign mattered to me. It gave me a starting point to share my passion for the importance of the acceptance, inclusion and value of every human being. With this new sense of purpose, my creativity began to flow. I began to write, not just words, but a song. 48 hours later, “It Starts With A Voice” was born. Our journey had begun. We recorded the song and began planning ways to share it. We held a Benefit Concert in our hometown, where we premiered our new song. The concert was a family event where Ben & I sang Broadway music intertwined with powerful narration delivered by our two oldest daughters and our thirty-one year old friend, who has Down Syndrome. The event raised thousands of dollars for the campaign, but more importantly it raised awareness. The focus of the evening was acceptance and inclusion where attendees were educated on the campaign and encouraged to make the pledge to “End the Word”. The day after the concert the song became available on iTunes, where a percentage of all sales benefit the campaign. We wanted our song to reach as many people as possible and so we created a music video to share online. The video was filmed at our home and gives viewers a glimpse into our daily lives, which brings me full circle to where this story began. We are all scared of the unknown. Having a glimpse into the lives of people living with intellectual disabilities takes away some of that fear. Spending time with them changes your heart forever. And so our journey continues. 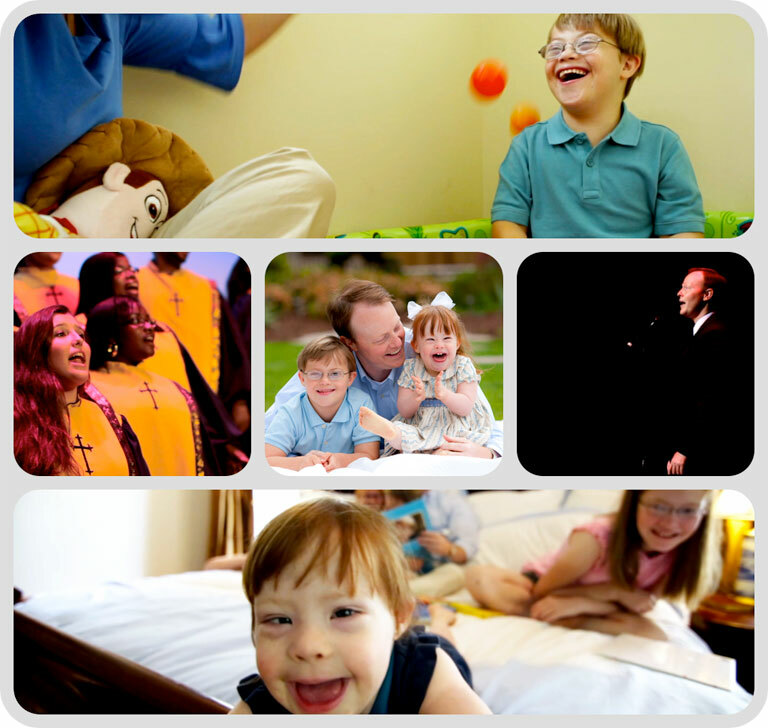 This summer our family shared “It Starts With A Voice” at several national conventions including the National Down Syndrome Congress and Best Buddies International. Our plan is to continue sharing our song, message and story with as many people as we can in hopes that people will realize that we are more alike than different. Follow our family’s journey on Facebook.